A friend of mine is going to be elevated to the Order of the Pelican next month. For those who are in the SCA you will know what a huge honor this is. For those who who aren’t in the SCA, never mind. Just know that is is a pretty cool thing. I am arranging a vigil for him, and making him a new wool tunic. I’ve chosen a deep burgundy-purple wool for the tunic, and dark green linen for the pants. I have a light tan wool for the neck facing. 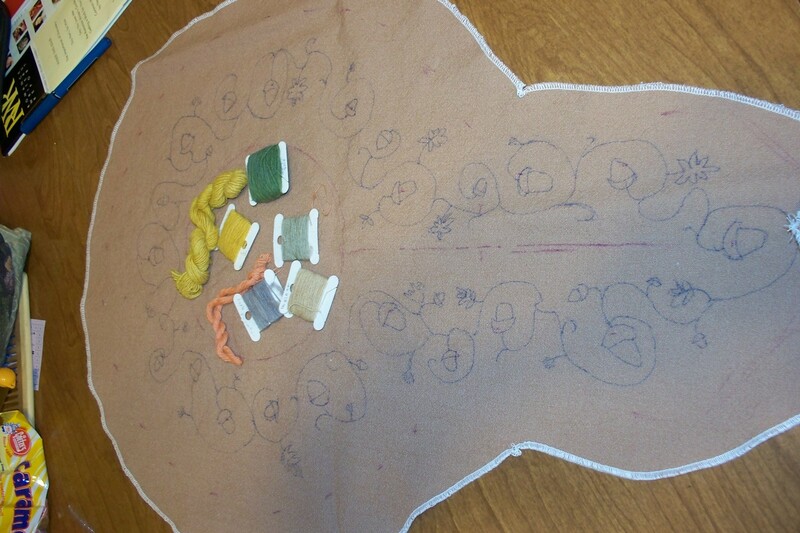 I’ve used my poor drawing skills to trace an embroidery design around the keyhole neck. His device is acorns, so I’m using acorns as the focus in the design. I hope to use my handspun wool embroidery thread for most of it, but I will use a bit of commercial black silk to outline the motifs, and some store bought wool for the broad band of couchedwork at the edge for a border . Berwyn has an Anglo-Saxon persona from after the Norman Conquest. He’s not rabid about authenticity, so I think the pattern I have chosen will work. Now I have three weeks to embroider the collar and sew the tunic and pants. Wish me luck! 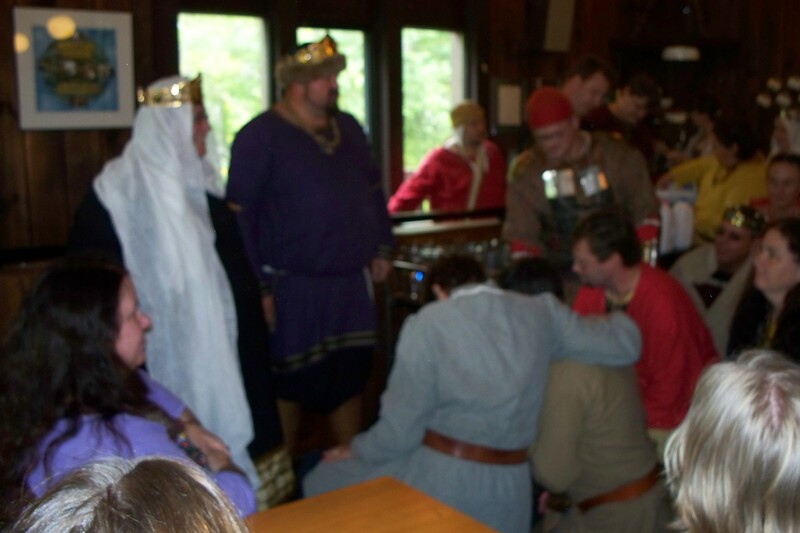 This weekend I attended the coronation of Hrodir and Anne in the Shire of Orlova Dolina in the Kingdom of Northshield. It was a great day. I got to see old friends and spend time with almost everyone I wanted to. Except I didn’t get much of a chance to chat with Lusche or Daye. *pout* But at least I got to say hello to Pete and Daye. 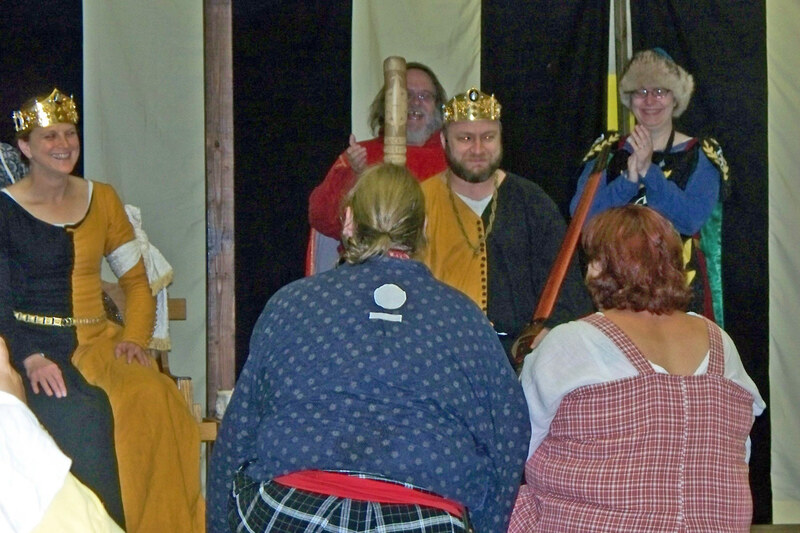 Lady Katherine d’Amiens is back in the Kingdom and was there for the event. So good to see her again! During the last court of Tom and Sigrid they called Toramassa up and said they had something that belonged to him and they wanted to give it back. Then they led Una, Toramasa’s wife, out and “gave her back” to him. She had spent the last year as their chamberlain. Everyone got a good laugh out of that. Tom and Sigrid stepped down and Hrodir and Anne stepped up. Some great things happened. Kenric was raised to the order of the Pelican! A very deserved honor. 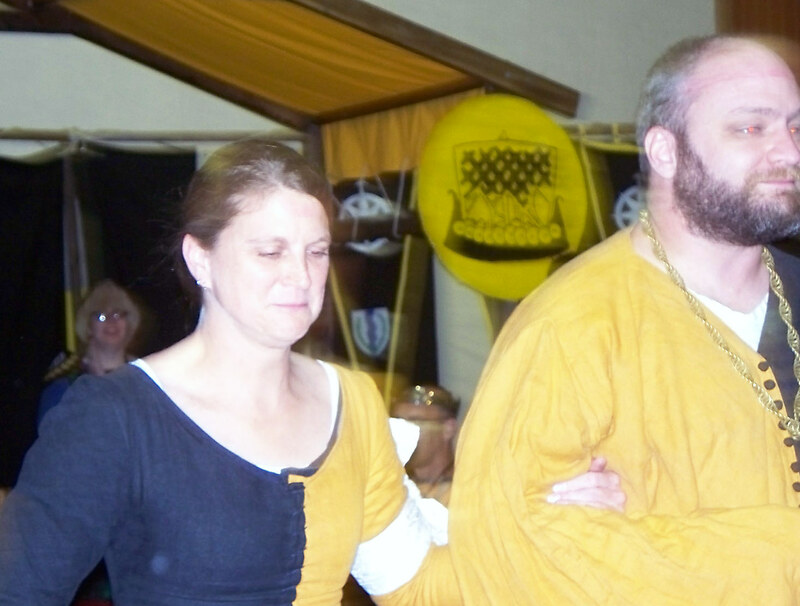 King Hrodir and Queen Anne swept into the eating hall and summoned him. As soon as he figured out that he was being put on vigil for the Pelican, his mouth literally fell open. Then he swore. This is the man that says maybe ten naughty words in a whole year. It was fun to see. Too bad the only pictures I have of this are of his back. But I got a pic of his wife watching. They had some wonderful personal news too. Speaking of good news, Patty Anne has a new job at last! I cannot imagine why other companies didn’t snap her up. She has more energy than any other ten people put together, she’s honest and generous and works hard. So, she starts her new position October 1. She looked marvellous! 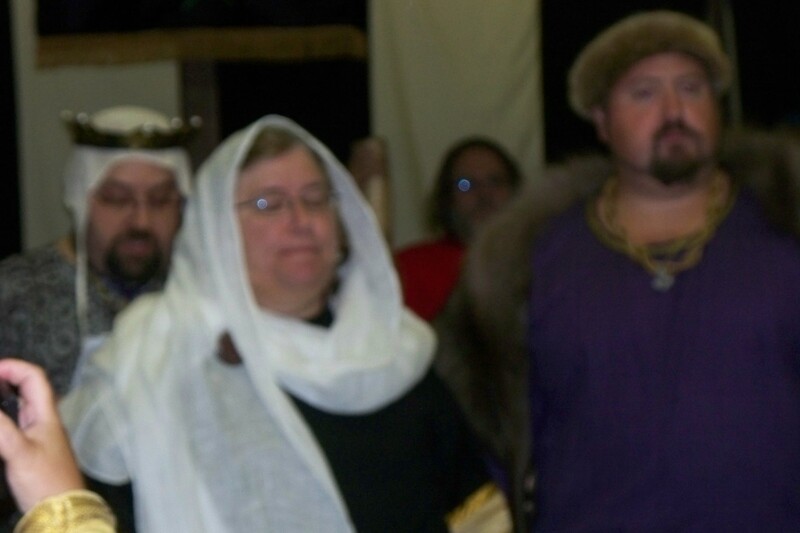 In other court news, Lady Asny Halfdansdottir is now the Honorable Lady Asny! 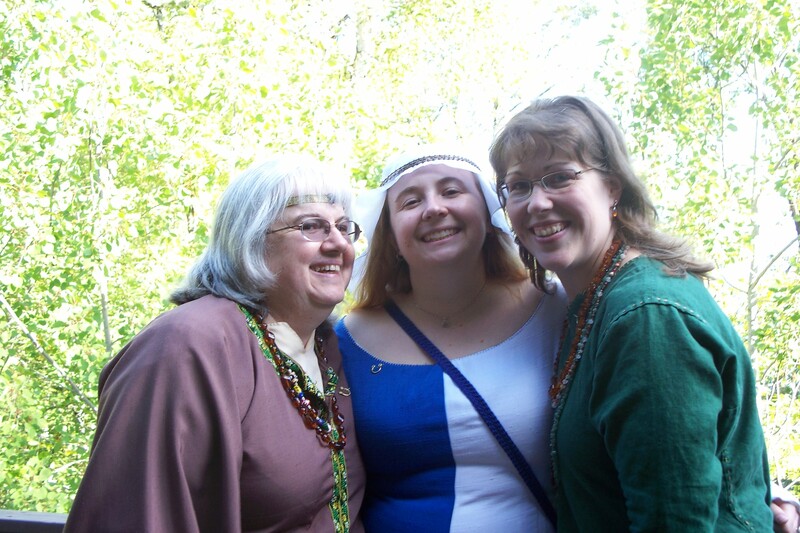 She was inducted into the order of Bridget’s Flame. Dang! No pics of her. Too bad. She looked gorgeous as always. 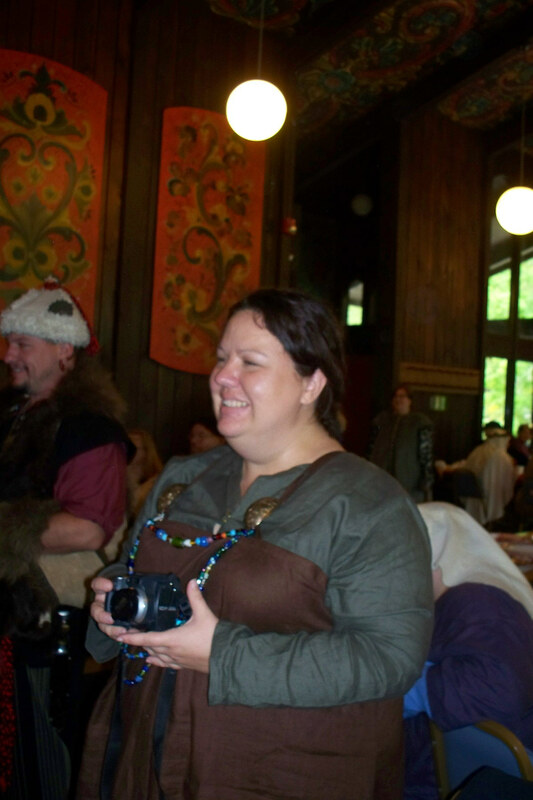 Also, THL Kolbrunnr Gilsdottir was made a Baroness of the Court! Again, no pics of her. 😦 But her hat is so pretty, and it looks stunning on her curly red hair. Gracious Queen Anne sat on her throne and waited with gentle courtesy for Master Kenric to continue. Kenric, in his quiet, stubborn way, would not be disuaded from his duty. Anyone who knows Kenric knows that he will always fulfil his duties. 🙂 Quiet he may be, but when he sees a need or a hurt he will be relentless in remedying the matter. 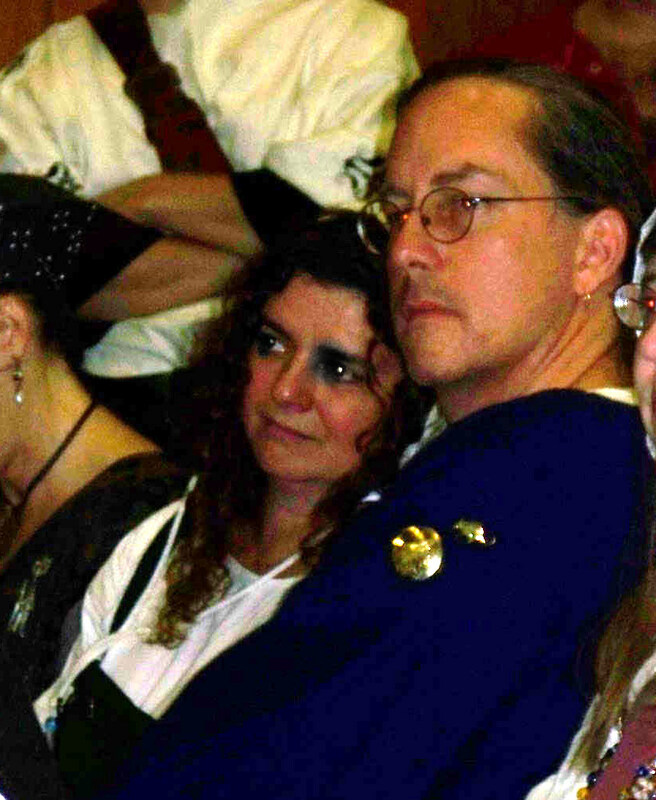 At which point the entire assembly roared while Baron Berwyn stood behind the throne with mouth agape and eyes popping. And so it came to pass that Baron Berwyn was put on vigil for the Pelican. 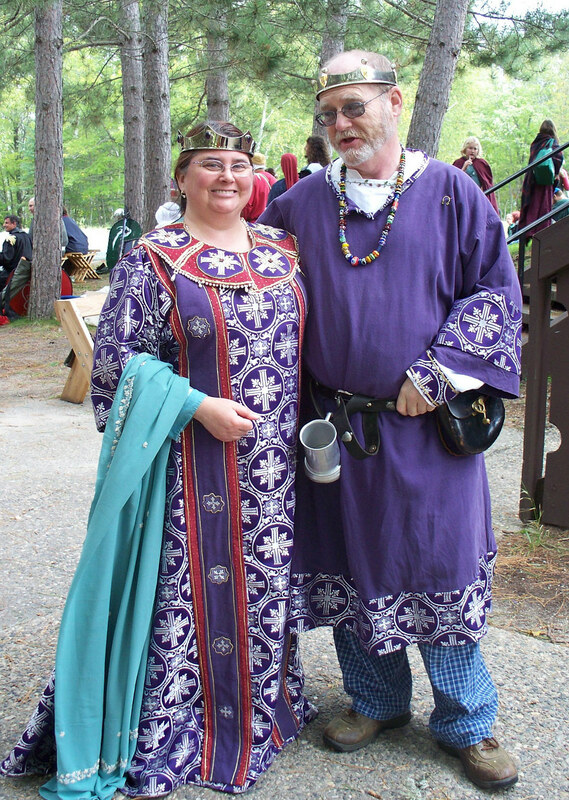 Here we are together in our matching purple silk Byzantine garb. It was a wonderful event. Orlova Dolina, forever after this event known as the shire with the unpronounceable name, was grant full shire status. Countess Gwyneth was made a baroness of the court. 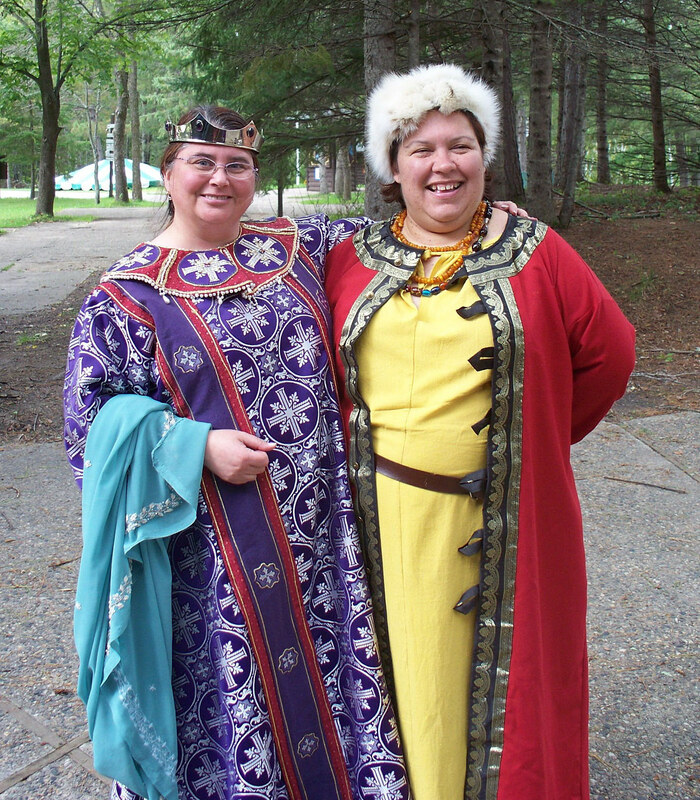 Mistress Chonach (that’s probably a wrong spelling) was made a baroness of the court. Champions were made and oaths given. The feast was really good. The lentil, peas and hazelnut dry stew was surprisingly tasty, and I’m going to have to make the peas/bacon and barley dish myself sometime. I’m not a fan of lamb, but I liked that too. The site was beautiful and the weather was great. A wonderful event all the way around.